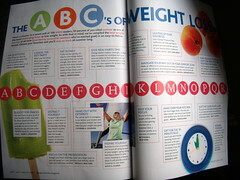 Take Off Pounds Sensibly (TOPS) is a non-profit weight loss group that’s been around since 1948. They have 200,000 members and 10,000 chapters in the world.1 They don’t “sell” a particular way of eating as long as it’s healthful but they do have exchanges on their recipes and such. TOPS has a magazine. TOPS meets weekly. TOPS has weigh-ins. TOPS has success stories. TOPS is a lot cheaper than Weight Watchers. So why did I join Weight Watchers instead of TOPS? Actually, I joined both. I signed up for TOPS, I think, in January or so. I picked a meeting night based on my school schedule and showed up. 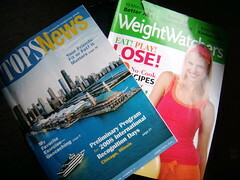 I paid $24 for the year which included a new members’ packet with weight-tracking booklet, magazine subscription and information about eating wisely. I went a few times but haven’t gone in a while. The meetings are member-run which means no TOPS-paid leader or staff. The members come up with contests and games that are weekly or monthly, depending on what the member running the event wants. TOPS also has retreats that all can go to that are held all over the place. I’ve belonged to TOPS once before and went fairly regularly. I was losing but was basically following the Core plan of Weight Watchers. I even ran a couple of the contests and made a huge contest compilation book for ideas. So, why’d I join Weight Watchers that costs me $39.95 a month? That’s more a month than I pay all year for TOPS! 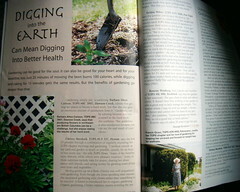 The top is a WW page layout ( July/August 2008 ) and the bottom is a TOPS magazine layout ( June 2008). WW magazine is slick, 2 months instead of just 1, a lot of ads, better photography, and better layout. TOPS has more reader-submitted content and is not as professionally designed. Which is better? Depends on what one wants. Weight Watchers (WW) started in the 1963. I couldn’t find a membership number but it has over 50,000 meetings a week around the world. I have over 25 at my meeting. At TOPS, it usually averaged 5-10 a meeting. So, I can assume that there are more members in Weight Watchers than TOPS. Both programs have the support of a meeting (if you sign up for meetings), and both have a maintenance program (oh to get to that!). But, the cultures are different. My local WW group is about 70% women in their 20s-lower 40s. Also, there is a program each week that is informative. I don’t like how WW pushes their products with little commercials — at least, I feel like they’re commercials — at the beginning of the meeting. “Blahblah is 50% off this week. It’s really good. Here are some recipes on how to use it.” I enjoy the programs of WW more than TOPS but WW has all those paid (underpaid, probably) staff members behind it. It also does the same program at different meetings whereas the TOPS chapter comes up with its own program. I also like that the leader of WW has been there, done that and was successful. Every meeting is different but the TOPS meetings I’ve been too are more openly accepting and friendly than the WW meetings. Both, I think are great. But I prefer Weight Watchers because it’s more serious… more professional… more consistent. However, if you need a low-cost, fun way to get support, I suggest TOPS. I like this comparison of WW and TOPS. The one thing that I rely heavily on is eTools, and the WW web site itself. I’m not thrilled with the “commercials” either, but I sure don’t mind getting the free samples!!! Speaking of free samples, I just posted some free sample offers that I found in the past hour or so, if you’re interested. Carol, thank you for coming over here too! Hm… 2 days and they were fine? I’ll have to try that! I want to try wraps and cut them to fit the laptop lunch that I have. I’ve seen some do that and it looks neat. 🙂 But the time thing… You have the right idea with doing it ahead though. I totally forgot about the free samples that WW meetings give out. Last week I got a stir stick that flavors milk. I haven’t tried it yet though. This is a terrific post. My mother attended TOPS years ago, but I didn’t know too much about it. I have always been with WW. The first time I was just 17 and couldn’t afford the meetings, so I bought the very first book. Diet was a lot more strict then. LOL. That was the first time I lost a lot of weight with WW. Love the pro’s and con’s of both. I should think about joining again, but I am so shy, I don’t get all I can out of groups. I think I need to re-read “Body Clutter”. Just reading that the first time made me want to make changes for myself. I’m quiet at the meetings too. But I know if I had a question that I could ask anyone and 90% of the time not get attitude. “Newb.” Nope. Cause a lot of people are new, returning, or such. Yes, but the damned bike. And use it. Usually I don’t learn article on blogs, however I would like to say that this write-up very forced me to check out and do it! Your writing style has been amazed me. Thanks, very great post. Hello there. I ran across a person’s web site using yahoo. This is a seriously perfectly composed document. Let me ensure that you book mark them and also go back to learn additional of your handy details. Was looking for submit. I’ll absolutely come back.